Texas police say 170 people are facing organized crime charges following a biker gang shootout, which left nine dead and 18 others injured in Waco on Sunday. Law enforcement remains on alert in the city, with officers saying they have received threats. The individuals are being “arrested and processed this morning...they will all face Engaging in Organized Crime charges. They are being booked and processed at this time...” the Waco Police Department wrote on its Facebook page on Monday. It was previously reported that 192 people were being charged, though that number was revised down.Sergeant W. Patrick Swanton stressed that the number will likely continue to be "flexible." In a Monday news conference, Swanton said that various biker groups have threatened law enforcement officers since the shootout took place. Twin Peaks restaurant – the scene of the crime – has been prohibited from selling liquor or "moving liquor in or out of the establishment" for seven days, though it is allowed to be open for food sales. However, Swanton said he hopes the restaurant will use this as a "cooling off period," choosing to remain closed out of "respect" for the community. The shootout occurred after five rival biker gangs gathered at the sports bar on Sunday, according to Swanton. Preliminary findings indicate that a dispute initially broke out in the bathroom. It quickly escalated to include knives and firearms as it spilled over into the parking lot. According to McLennan County Sheriff Parnell McNamara, all nine of those killed were members of the Bandidos or Cossacks gangs. Their identities have not yet been released. Eighteen others were wounded. Swanton said that law enforcement is in the process of diagraming the evidence at the scene, adding that this will take a significant amount of time. “This is obviously a very large investigation...and we're going to get it right," he said. At least 50 weapons have been recovered from the scene, including brass knuckles, knives, and clubs. Hundreds of cars and motorcycles are still in the parking lot, many of which are riddled with bullet holes. Police and the operators of Twin Peaks were aware of the bikers' meeting in advance. At least 12 Waco officers, along with state troopers, were outside the restaurant when the fighting began. Swanton said the officers shot armed bikers, and that the actions of law enforcement prevented further deaths. It was not immediately clear whether any of the bikers were killed by police bullets. 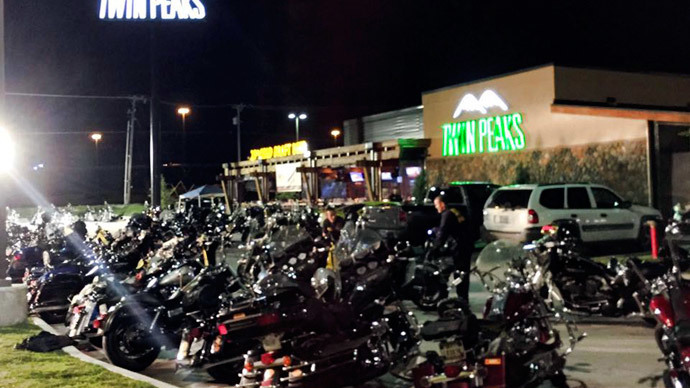 The sergeant was critical of the management of Twin Peaks, saying it had recently failed to cooperate with law enforcement as it tried to deal with biker gangs. “We knew there would be trouble at this biker event,” Swanton said. “What happened here today could have been avoided.” He said the restaurant had been warned for two months, but has the right to serve whoever it wants. However, a statement on behalf of Jay Patel, operating partner for the Waco franchise, said his management team has had "ongoing and positive communications with the police." Swanton called his comment an “absolute fabrication,” adding that the restaurant chain's national office was contacted about a week ago after local management refused to help. The police sergeant stressed that the area is now safe, with a large number of SWAT officers still at the scene. He noted that the parking lot is currently limited to media and law enforcement. There are more than 300 outlaw motorcycle gangs operating across the US, ranging in size from a few members to several hundred, according to federal gang estimates.